Russell Baker, D.O., an assistant professor in the Department of Emergency Medicine at Texas Tech University Health Sciences Center El Paso (TTUHSC El Paso), is on a mission to close the gaps in emergency medicine service (EMS) education for the city’s first responders to emergencies. On Friday, April 20, Texas Tech University Health Sciences Center El Paso hosted its second annual EMS Conference. The conference trains EMS responders in interprofessional collaboration to improve patient outcomes. EMS personnel are the paramedics and fire/emergency medical technicians who take care of patients before they arrive at a hospital. While working in the Department of Emergency Medicine, Baker came to realize that there were limited educational opportunities for EMS personnel in El Paso, and few chances for them to interact with the hospital professionals that receive emergency patients. It was out of that need that TTUHSC El Paso’s first EMS Conference was born last year. And on April 20, Dr. Baker helped lead TTUHSC El Paso’s annual EMS Conference for the second year. Baker started the conference with Katherine Raczek, M.D., now a third-year ER resident in TTUHSC El Paso’s Department of Emergency Medicine. Dr. Raczek said attendance has doubled over last year, with about 40 paramedics, EMTs, EMT students and Paul L. Foster School of Medicine students attending in 2018. In addition to hands-on training, the goal of the conference is to improve relationships and teamwork between EMS personnel and emergency medicine doctors, so that the transition of care is smooth when patients enter a hospital. Keelin Boulware, an El Paso firefighter, has attended the EMS Conference both years. He said the conference allows him to talk to in-hospital providers and learn how they think about patient care. The morning of the conference was dedicated to classroom learning, while the afternoon had breakout sessions with hands-on training in the Gayle Greve Hunt School of Nursing’s Regional Simulation and Training Center. The 12,000-square-foot facility trains health care professionals using an interprofessional model. The center trains nurses, nursing and medical students, residents, physicians and ancillary personnel to work as a team, leading to improved communication and, ultimately, better patient outcomes. 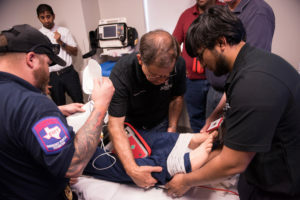 Lectures from TTUHSC El Paso emergency medicine physicians and residents, plus the capabilities of the simulation center, allowed EMS personnel in El Paso and Southern New Mexico to receive education not typically available in the area, which will better prepare them to care for patients.